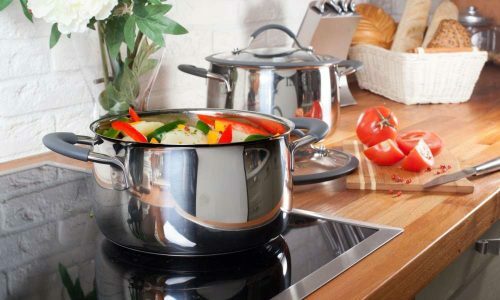 While regular stovetops are still very relevant and necessary, portable induction cooktops have come to be a great solution for your cooking needs, especially for those who have limited space. One significant benefit of owning an induction cooktop is that there is no flame and the burner doesn’t get hot like a regular electric burner. 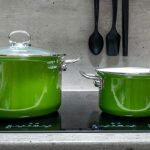 We’ve taken a look at five of what we think are the best double induction cooktops on the market, and broken them down with comparisons, reviews, and pros and cons. 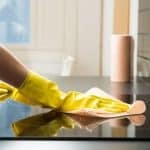 Let’s take a look at exactly why these specialized cooktops made it to the list of the the best. 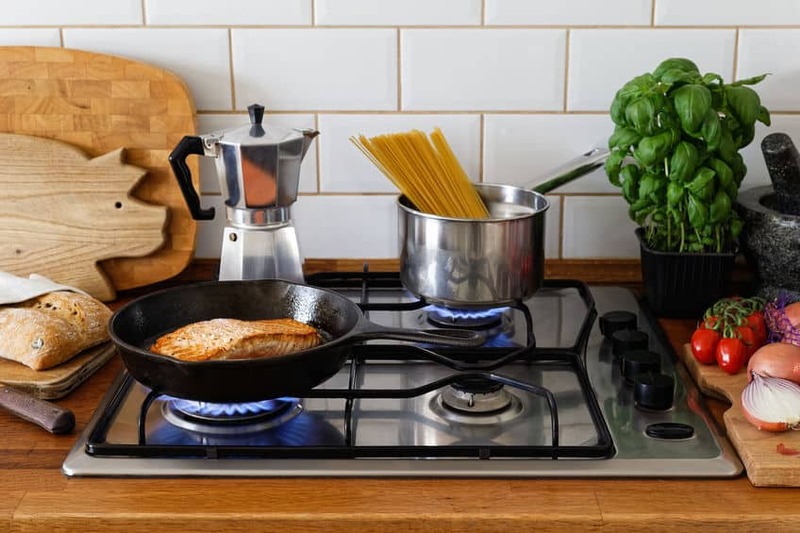 In this article we endeavored to find the top five single burner induction cooktops. 14.25" x 23.5" x 2.5"
* There are no power options available in the NutriChef cooktop. The temperature settings can only be used. The Cuisinart ICT-60 Double Induction Cooktop, Black is a straightforward, easy-to-use unit that has the basic functions. If you need a couple of extra burners or prefer to use an induction cooker instead of a gas or electric stovetop, then this is a good option. The temperature reading is displayed only in Watts and there are pre-set levels. However, there is no option to set a temperature in Celsius or Fahrenheit. This unit has separate control panels for each burner. The functions are: ON/OFF, timer, heat, and up and down arrows, and LED. The bright LED displays error codes and the heat adjustments allow for safe and flame-free cooking. The cooktop remains on for up to 180 minutes at a time. The electrical requirements for this induction cooker are 120V/60MHz. The maximum power of the burners is 1200 and 600 watts and can be used simultaneously. The left burner has eight settings with levels 1 to 8 with a power range of 200-1200W. The right burner has five settings with levels 1 to 5 with a power range of 200-600W. The wattage is NOT shown, nor is the temperature. The cookware should have a base diameter of at least 4.7 inches. The individual timers can be adjusted up to 150 minutes by pressing and holding the up arrow. If the food has been cooking for 30 minutes, the timer can be set for up to 150 minutes since it will shut off after 180 minutes. 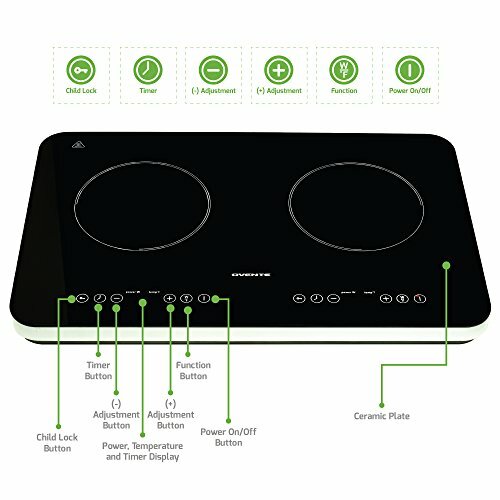 Why Buy This Particular 2 Burner Induction Cooker? This unit is a reasonable option for those want a two burner induction cooktop but either aren't technology savvy or who just want a simple, no-frills unit. The cooker is very easy to operate. All you have to do is plug the unit into an electrical outlet, place your induction ready cookware and ingredients on the cooktop, press ON/OFF button, press the HEAT button and use the up and down arrows to select the desired setting. That's it. Although there is a timer function, it does not have to be used. As a safety feature, the unit will automatically shut off after 180 minutes. One nice feature of this Cuisinart induction cooker is that it only shuts off if a pan has been removed from the cooktop for more than 30 seconds. This gives the cook time to stir or flip the food and place it back on the burner without having to power it up again. Surprisingly, Cuisinart offers a three-year limited warranty on this induction hob. Most companies only offer a one year warranty. While it’s true this cooktop has been made by the same company that makes the “As-Seen-On-TV” single induction burner, it’s not a gimmick. This portable induction cooker has two burners, each having its own panel with touch keys. The functions include a programmable timer and memory, a large temperature range, and six pre-programmed settings. The price is quite reasonable considering everything that it offers. 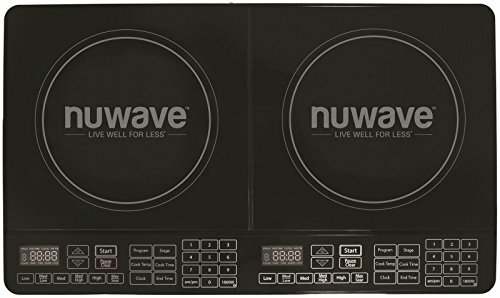 The NuWave 30602 Double Precision Induction Cooktop Burner has a total maximum output of 1800W. Each burner has its own control panel. The burners are the same size. The NuWave fact sheet states that when both sides are being used, each burner can accommodate a pan up to 10.5" and 12" when using one side. 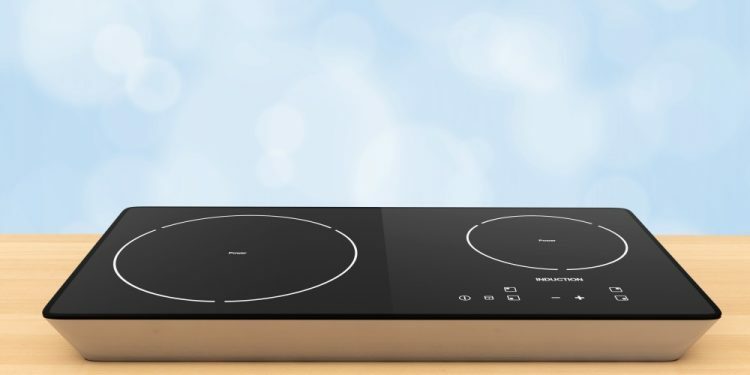 This two burner NuWave induction cooker is designed to be set on a countertop. The surface is made of a heat-resistant glass. There is a separate control panel for each burner. The dimensions of the entire unit, in inches are: 14.1 x 23.6 x 2.6 (LxWxH). The cooktop surface of each burner is: 10.8x11.5 (Lx W). This unit weighs 13.8 pounds. The diameter of the coil is 8 inches (per Nuwave customer service). The temperature range of this NuWave double induction cooktop is 100-575ºF and can be read in either Celsius or Fahrenheit. 1. Select one of these six pre-programmed temperature settings: low, med/low, medium, medium/high, high and sear. 2. Press the COOK TEMP function and set the desired temperature using the up and down arrow keys. The temperature settings can be controlled in 5 minute increments so you can cook your food exactly how you like it. If both burners are used simultaneously, the power will automatically be 900W on each side. If one burner is used, the maximum output is 1800W. However, if you want to use one burner at 900W then press the "1800W" control. The electrical requirements are 120V/15A. A programmable memory that can run without shutting itself off is available as well as an end time programmable clock. Another useful feature of this cooker is a warming function that can keep food warm for 2 hours at 155ºF. The digital displays make it easy to understand and give you error readouts when something is wrong. For example, if a pot is removed, an error code will appear. Some induction cooktops have a high pitched sound, however, this one does not. Another benefit is the rust-resistant material that is used during the design process of the NuWave model. You don’t need to worry about the elements rusting. While the Ovente brand is not as well known as Cuisinart or NuWave, it was included because it is a formidable competitor to the other double induction cooktops on our list. The Ovente Ceramic Induction Cooktop Burner Ovente Induction Countertop Burner, Cool-Touch Ceramic Glass Cooktop with Temperature Control, Timer, 1800-Watts, Digital LED Touchscreen Display, Indoor/Outdoor Portable Double Hot Plate (BG62B)[/easyazon_link] is a very nice portable, reasonably priced two burner induction cooktop. The overall design is sleek, simple and easy to operate. Meals can be prepared using either the power or the temperature mode. This 120 Volt, 1800 Watt induction cooktop has two burners, each with its own set of controls. The burners are the same size and have a diameter of 7.1 inches. Settings can be quickly changed using the LED touchscreen controls. The cooktop surface is ceramic glass making it very easy to clean. The controls are represented by icons in a circle and are the same for each burner. From left to right these controls are: control panel lock (sometimes called "child lock"), timer, decrease power/temperature/timer display, LED display, increase power/temperature, function [power (Watt)/temperature (F)], and the power on/off button. The dimensions of this Ovente countertop burner, in inches are: 15.25 x 23.7 x 2.7. This unit weighs 13.3 pounds. This cooktop has a total maximum power of 1800 Watts. ​The 8 power levels are: 100, 300, 500, 700, 900, 1100, 1300, and 1800 watts. The default power level is 900 Watts. The power on each burner can be set independently. However, the unit will not allow the total to be more than 1800 Watts. For example, if the left burner is set for 1100 Watts, the unit knows that only 700 Watts is available on the right burner. To use the power mode, press the temperature/power button (icon with W/F) once. The default power of 900W will appear in the LED display. Then use the plus/minute buttons to select one of the 8 power levels. There are a number of ways in which the wattage can be distributed. 1. One burner can be used at a maximum power of 1800W. 2. Two burners can be used with a total of 1800W. If the left burner is set for 1100 watts, the right burner will automatically adjust to 700 watts. The right burner can then be adjusted downward if less power is needed. 3. Two burners can be used with a total power less than 1800W. If, for example, you want the setting on the left burner to be 300W, and the right burner is set for 700W, there will not be an adjustment. A total of 1800W does not have to be used. This Ovente double induction cooktop has 8 temperature settings with the readings as Fahrenheit. The settings are: 140, 195, 250, 300, 355, 400, 430, and 465ºF. There are some pictures of this unit that show a "C" next to the temperature setting while others show an "F". The units shipped to the customers in the United States display temperatures in Fahrenheit. The user can program the timer from one minute to three hours. When the timer button is pressed, it will appear in the default mode of 30 minutes. The + button changes the minutes and the - button changes the hours. To cancel the programmed time, simply press the timer icon. 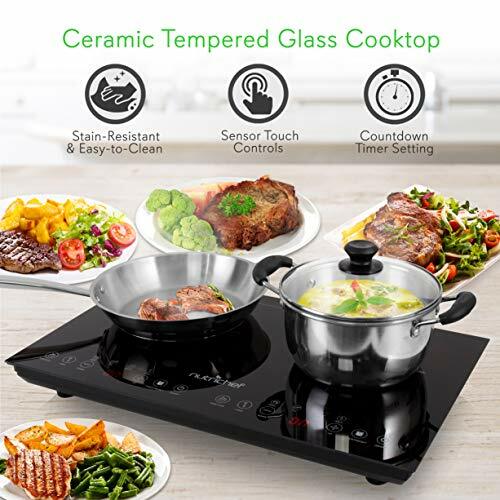 The Ovente Induction Countertop Burner, Cool-Touch Ceramic Glass Cooktop with Temperature Control, Timer, 1800-Watts, Digital LED Touchscreen Display, Indoor/Outdoor Portable Double Hot Plate (BG62B) has a wide array of safety features. The unit will shut down immediately if the voltage is too high or too low or if it reaches a certain temperature. If the cooker is switched on but does not have an induction compatible pot or pan on the surface, it will beep for approximately 30 seconds and then shut off automatically. The lock function prevents the temperature, power or timer settings from being accidentally changed. Once activated, the only function that will work is the On/Off Button. To deactivate the Control Panel Lock, press and hold the lock button for 3 seconds. Alternatively, press the On/Off button which will cancel the lock setting. Induction ready cookware must be used. For best results, place the pot or pan in the center of the placement guide. It should have a base diameter 4.75 inches and 8 inches. The easiest way to tell if your cookware is compatible is by testing it with a magnet. Simply take a magnet and hold it near the bottom of the cookware. If it sticks to the bottom of your pots and pans securely, then you know that it will work. This cooktop is compatible with stainless steel, enameled, cast iron, and magnetic pots and pans, and can accommodate pots up to 12 inches in diameter. The Ovente customer service goes above and beyond to assist with queries. I emailed them asking three questions. After a couple of emails back and forth, the customer service representative asked if he could call me directly. A very personable gentleman called immediately and answered my questions completely. 1. The cook does not need to be a tech wiz to operate this cooktop. Add the ingredients to the pot or pan and place them in the center of the placement guide on the cooktop. Plug the unit into a 120V outlet. Choose the cooking mode you want - either temperature (ºF) or power (W) selector. Adjust the temperature or power setting by pressing the plus or minus button. Press the ON/Off button when finished cooking. 3. Temperature and power controls. 5. Touchscreen controls instead of push buttons. The Ovente limited one-year warranty for this product is only valid if both of these conditions are met: 1) the unit must be purchased from an authorized reseller and 2) the product must be registered within 30 days of purchase. This can be completed online. The warranty only covers defects in workmanship and materials. The True Induction company is known for its excellent customer service and its range of models that suits a variety of customers. The cooktop we are reviewing here, the True Induction TI-2C Cooktop, Double Burner is a portable unit. True Induction has a double burner model that is an inset,True Induction MD2B Mini Duo Portable Counter Inset Double Burner Induction Cooktop . The True Induction TI-2C is a reasonably priced 1800 Watt two burner induction cooktop. The one piece ceramic glass top is modern looking and easy to clean. Each burner has its own set of controls. The settings can be quickly changed using the LED touchscreen controls. This model has both heat (power) and temperature modes. It is possible to use the HEAT function on one burner and the TEMP setting on the other burner. In this scenario, the maximum HEAT setting is 5. The controls are represented by icons in a square and are the same for each burner. From left to right these controls are: display, minus (decrease power/temp), plus (increase power/temp), heat, temperature, timer, and the power on/off button. The dimensions of this unit are: 23 1/2” W x 14’’ L x 2 1/2’’ H. It must be plugged into a 120V outlet and has a polarized plug. The True Induction TI-2C Double Cooktop has 10 power levels for each burner. The TI-2C model is designed with True Inductions patented power-sharing technology. This allows the burners to split wattage between the left and right side. Both burners can be used at 1800 Watts although not simultaneously as the power consumption is automatically balanced. If both burners are being used, the combined total power is 10. Power sharing works in this manner: if one burner is set at 2, the other side will automatically adjust to level 8. There are 10 temperature levels (for each burner) with a range of 150ºF to 450ºF. The temperatures in Fahrenheit are: 150, 180, 210, 240, 270, 300, 330, 360, 390, 420 and 450. The timer can be set up to 150 minutes in 5 minute intervals. The remaining time is counted down one minute at a time and is shown in the display. The timer duration can be changed at any time (the HEAT or TEMP setting will not be affected). The reverse is also true, changing the HEAT or TEMP will not affect the timer setting. Induction compatible cookware must be used with this cooker. The base of the cooking vessel must be greater than 4.5 inches and less than 10 inches. This unit has a standby mode. Once the unit is plugged in to a 120V outlet, the power button will light up and a beep will indicate the unit is on. The unit will stay in the standby mode until further action is taken. After placing the induction ready cookware and contents on the cooktop, press the POWER button and the unit will turn on. These are the safety features for this True Induction double burner cooktop. The unit will not turn on unless induction compatible cookware is placed on the unit. After 150 minutes of continuous use, the unit will beep and then go into the standby mode. It will have to be switched on again to restart. If the cooking temperature is over 450ºF in the TEMP mode, the unit will switch to the standby mode. After 3 minutes in standby, the unit will shut off. The warranty is only honored if the unit is purchased from an authorized True Induction dealer. True Induction's website states that Amazon.com is an authorized reseller. To activate the warranty, complete and return the warranty activated card provided in the packaging within 10 days of purchase. True Induction states that if the warranty registration card is not completed and returned, only the standard 1 year limited warranty will apply. To be on the safe side, if you do purchase this unit, either register it online (http://www.trueinduction.com/registration.aspx) and get a confirmation of that registration or return the completed card as soon as you receive the product. The NutriChef PKSTIND48 Double Induction Cooktop is an 1800 Watt unit with multiple cooking modes. This 120 Volt NutriChef induction cooktop has four preset functions from which to choose. These functions are: Fry, Steam, Water, and Warm. This model does not have a Temperature setting which allows you to either set a specific temperature. 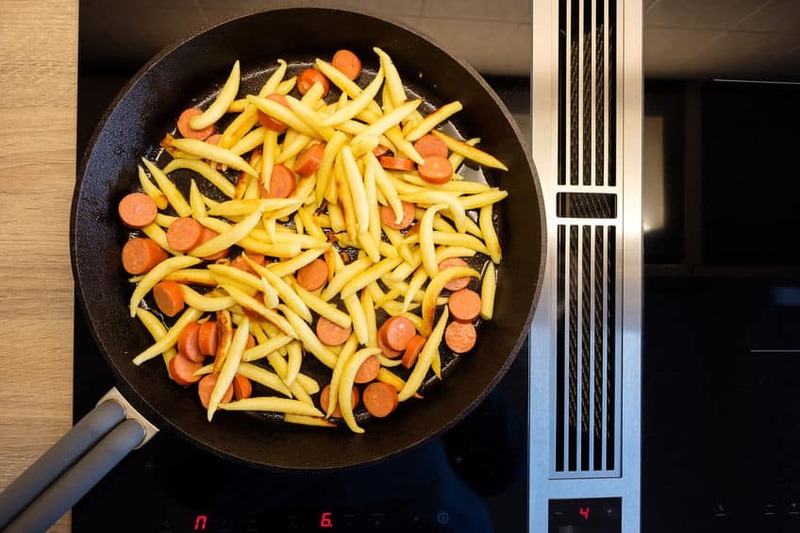 Once the function is chosen, then when using the Fry, Steam, or Water functions, the temperature can be selected from one of eight preset levels. The [Warm] function only operates at the default temperature of 140ºF. The temperature is displayed is Fahrenheit. Food can be cooked at a high temperature on one element while using the other to warm your food. If both burners are used simultaneously, the maximum temperature on each burner is 230ºF. (per PyleAudio - NutriChef telephone customer service). The ceramic tempered glass that makes up the surface is scratch proof. Each burner has its own control panel including a digital LCD display screen with touch sensor controls. The heating zones have a diameter of 6.7 inches. Cookware should be set in the center of the placement guides. This unit weighs 15.5 pounds and has dimensions of 14.2’’ x 23.6’’ x 2.6’’ (LxWxH). Each option has its own default temperature and maximum timer setting. The temperature range is: 140ºF to 460ºF. There are 8 temperature levels available to select from when using these functions. They are the same for ALL of the functions. The levels are: 140, 210, 260, 300, 350, 390, 430, 460ºF. The default temperature is 300ºF. This can be changed to any one of the eight temperatures levels by pressing the [+] or [-] key. To set the timer, press the [Timer] key until the indicator of [Timer] lights up. The preset can be set up for up to 4 hours. The default temperature is 390ºF. This can be changed to any one of the eight temperatures levels by pressing the [+] or [-] key. To set the timer, press the [Timer] key until the indicator of [Preset] lights up. The preset can be set up for up to 23 hours 59 minutes. The default temperature is ​460ºF. This can be changed to any one of the eight temperatures levels by pressing the [+] or [-] key. The timer can be set for up to 4 hours. The default temperature of the Warm setting is 140ºF. This cannot be changed. The timer can be set after the cooking mode is selected. The maximum time the [Timer] can be set when using the Fry or Water functions is 4 hours. The maximum time the [Preset] can be set when using the Steam or Warm functions is 23 hours 59 minutes. This NutriChef Portable Dual 120V Electric Induction Cooker Cooktop - Digital Ceramic Countertop Double Burner w/ Kids Safety Lock - Works with Stainless Steel Pan & Other Magnetic Cookware has the following safety features: child lock, low and high voltage warning, auto pan detection (detects incompatible cookware or if there is no cookware on the burner), and top plate overheating. The base of induction friendly pots and pans greater than 4.7 inches (12 cm) and less than 10.2 (26 cm) inches should be used. I called PyleAudio-NutriChef customer service and asked several questions. A representative answered them completely in a professional and friendly manner. He took the time to consult with the technical department to ensure he provided the correct answers. 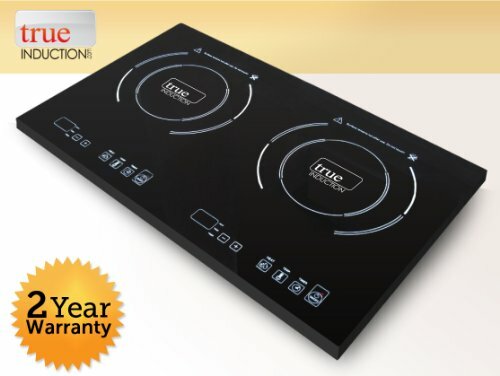 This NutriChef cooktop comes with a 1-year limited manufacturer’s warranty. Additionally, a full refund within the first 30 days is available if you aren’t happy with the product.